A viral disease that is characterized by the acute appearance of round to oval cutaneous lesions that heal in three to four weeks. Pigs are the only host and reservoir of the virus. Swine pox occurs only in swine. All age groups are susceptible but most outbreaks are encountered in young growing pigs. It occasionally occurs congenitally and in neonates. Swine pox occurs worldwide in the major swine-raising countries. It occurs more often where insect vectors of pox virus are not controlled. Modern swine raised free of lice rarely exhibit the disease. Swinepox is an acute, often mild, infectious disease characterized by skin eruptions that affects only pigs. It is present in the USA, particularly in the Midwest, and has been reported from all continents, although the incidence is generally low. Swine pox was first reported in Europe in 1842 and in the United States in 1929. The disease persisted and was relatively common, perhaps because it caused little obvious economic loss to swine producers. Outbreaks once were caused by two viruses: vaccinia virus, a laboratory strain, and swine pox virus. Vaccinia virus is no longer used to vaccinate people against small pox; hence it no longer spreads to pigs. Only swine pox virus now causes pox in swine. Historically, vaccinia virus was involved in some outbreaks; currently, swinepox virus appears to be the only cause. The disease described here is that caused by the latter. Swinepox virus is distinct from other poxviruses and does not protect against infection with vaccinia virus. It will grow on pig cell cultures but not embryonating eggs. It is relatively heat stable and survives for ~10 days at 37°C (98.6°F). Swine pox virus, a member of the Poxviridae family, is the etiologic agent. The virus is rather resistant to environmental degradation; it persists in scabs for up to a year. Microscopically, the virus is visible as large intracytoplasmic inclusions in infected cells. Persistent virus within desquamated scabs can be transmitted to other pigs when introduced into skin abrasions. The virus can also spread horizontally from nasal and oral secretions from infected pigs. Once a few virus-containing lesions appear, the virus can be transmitted mechanically by the bites of vectors that have recently fed in pox lesion areas. Common vectors include the hog louse (Haematopinus suis), mosquitoes, and biting flies. Once introduced, infected swine or virus-carrying biting insects can initiate outbreaks in susceptible herds. There is evidence of transplacental infection of neonatal pigs. The disease is most frequently seen in young pigs, 3–6 wk old, but all ages may be affected. After an incubation period of ~1 wk, small red areas may be seen most frequently on the face, ears, inside the legs, and abdomen. These develop into papules and, within a few days, pustules or small vesicles may be seen. The centers of the pustules become dry and scabbed and are surrounded by a raised, inflamed zone so that the lesions appear umbilicated. 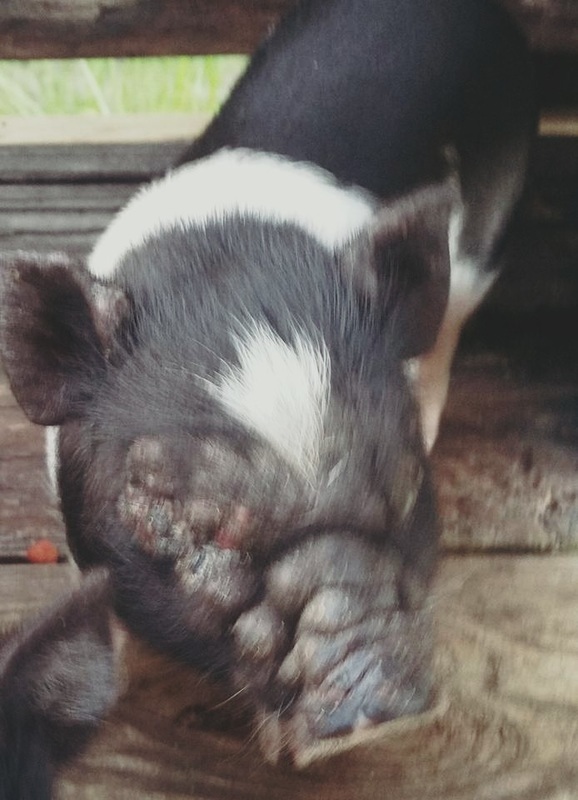 Later, dark scabs (1–2 cm in diameter) form, giving affected piglets a spotted appearance. These eventually drop or are rubbed off without leaving a scar. Successive crops of lesions can occur so that all are not at the same stage. The early stage of the disease may be accompanied by mild fever, inappetence, and dullness. Few pigs die of uncomplicated swinepox. Virus is abundant in the lesions and can be transferred from pig to pig by the biting louse (Haematopinus suis). The disease also may be transmitted, possibly between farms, by other insects acting as mechanical carriers. Recovered pigs are immune. There is no specific treatment. Eradication of lice is important should that be the cause. Virus introduced into abrasions replicates in cells of the stratum spinosum causing typical skin lesions to develop. The lesions go through the stages of macules, papules, vesicles, pustules and crusts. All but the vesicle stage are easily identified. As lesions mature and heal, crusts containing virus desquamate and leave white macules. A viremic stage of the disease has not been demonstrated. However, it must occur in some animals since transplacental infection of neonatal piglets has been reported. Antibody to pox virus is formed as a consequence of infection and immunity is long lasting. This is a disease caused by the swine pox virus which can survive outside the pig for long periods of time and is resistant to environmental changes. It is a vesicular disease characterised by small circular red areas 10-20mm in diameter that commence with a vesicle containing straw-coloured fluid in the centre. After two to three days the vesicle ruptures and a scab is formed which gradually turns black. 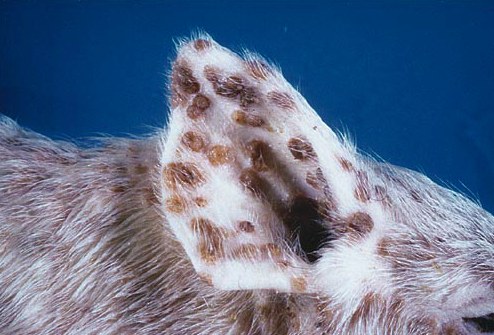 The lesions may be seen on any part of the body but are common along the flanks, abdomens and occasionally the ears. There is no treatment and the condition usually resolves itself spontaneously over a three week period. It can be spread by lice or mange mites. It can be confused with localised greasy pig disease, pustular dermatitis and the allergic form of mange. 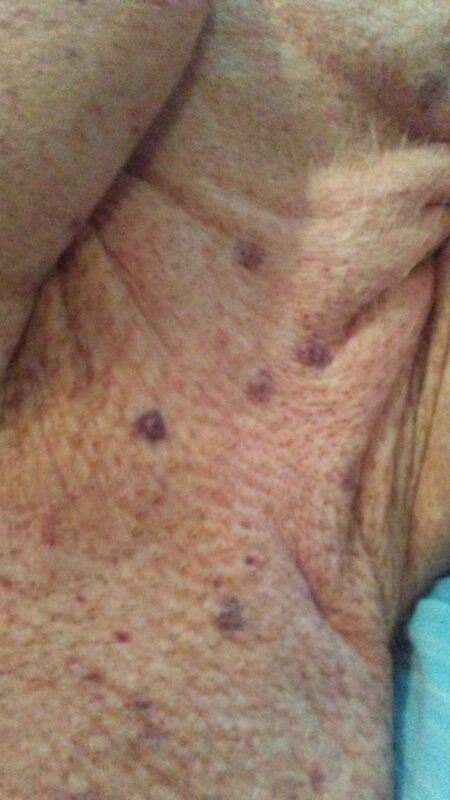 Systemic clinical signs of disease seldom are observed but the skin lesions are easily seen. 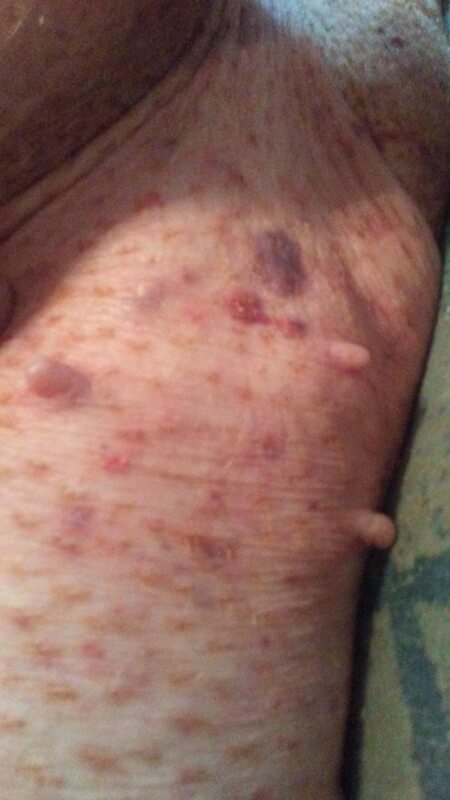 Initial lesions usually are along the ventral aspect of the abdomen, inside the legs and in inguinal areas, all favorite feeding sites of hog lice. However, lesions have been observed at many cutaneous sites so most of the skin appears susceptible. Initially, there are small vesicles that largely are unnoticed. The papules that result are seen as 1-3 mm circular red spots. As lesions mature, crusts form that eventually heal uneventfully. In severe infections, lesions may occur in upper respiratory and digestive tracts. This is particularly true of congenitally-acquired pox where piglets are born with or develop lesions over the entire body shortly after birth. 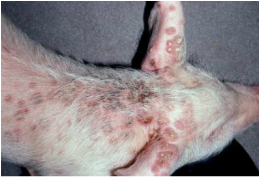 Exudative epidermitis (greasy pig disease) and secondary bacterial dermatitis occasionally occur as a sequel to swine pox. Swine pox does not appear to cause a pruritic response in affected pigs. The skin lesions are typically observed on ventral aspect of the abdomen, legs, inguinal region, tail and snout. However, in a few of the more severe affected animals, the skin lesions can be seen on whole body. ​Swine pox virus may enter the host through preexisting skin abrasions, with the exception of moderate changes in superficial lymph nodes, tissues other than the skin are rarely affected. This virus causes eruptive dermatitis in pigs. Animals up to 3 months of age are most susceptible, with adults usually developing a mild, self limiting form of the disease. Multiple cutaneous lesions are commonly found on the flanks, belly, inner side of the legs, ears and less common, face. Swine pox is easily diagnosed by identifying the lesions. Lesions are round to oval, usually less than 1.0 cm in diameter. The brown to black crusts are easily seen but the vesicle stage seldom can be identified grossly. If confirmation is needed, histologic diagnosis can be made by identifying typical, large, intracytoplasmic inclusion bodies in cutaneous lesions. Pox lesions should be differentiated from those of other vesiculating viral diseases, pityriasis rosea, dermatosis vegetans, streptococcal dermatitis, ringworm and greasy pig disease. Control of swine pox relies on herd immunity and prevention of transmission. Pox seldom is a problem if the usual vectors of virus, especially hog lice, are controlled by insecticides or elimination. Congenital swine pox is generally a sporadic, self-limiting event. There is no specific treatment for swine pox, but antibiotics are typically recommended for treatment of secondary bacterial infections. Anti-parasite medications should be helpful as well, especially if there is a possibility that the pig had a parasite that has caused an outbreak. Click here to read more about parasite control. Good general sanitation as well as ectoparasite control are highly recommended and should be practiced. The two pictures above are confirmed cases of swine pox taken by Deborah Morgan of When Pigs Fly Rescue & Sanctuary.